Well, it looks like we will definitely be getting some smiles fed today (and tomorrow and Thursday - but more about that tomorrow!) 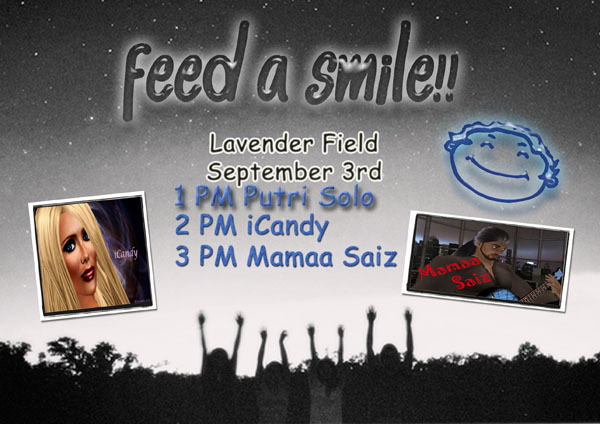 We have a super lineup starting with our lovely friend Putri Solo at 1PM slt leading the way for the premiere performance of iCandy Overland ...and then the fabulous guitar and voice of the one and only Mamaa Saiz. Please join us and have a great time being a part of it all. After setting up the donation board at Wharf Café and Beach Venue, Jensmith introduced me to her friends at the Wild Girls MC sim. Wow, I’d never seen anything like it before. Jump on your motorcycle and race along the tracks on the Barefoot Pass. 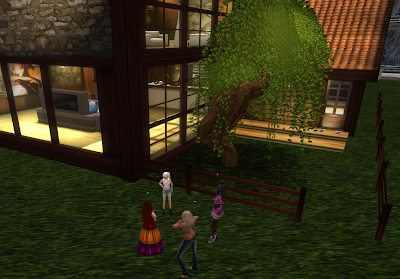 Then have a good time at the The Wild Girl’s. I was fascinated with the landscaping and the lovely women running the sim, Leela Juventa and Pat Footpad. I hope to be greeting you at the Lavender Field today for some fun – music and dancing!